Instead of checking in where you are - like Foursquare - with Foodzy you check in what you eat and drink during the day. Looking for a product is easy: just type in the first few letters and the product pops up in the search results so that you can check it in with just one click. Over time, your favourite products get remembered and show up automatically on your home screen, making daily food check-ins of products you eat regularly even easier. The main goal of Foodzy is to get insights into the way you eat. Every product page shows you how often you've eaten or drunk that product, and which of your friends have had the same product. Foodzy uses localized food databases in over 58 countries, and is currently available in English, French, German and Dutch. Foodzy encourages you to maintain a healthy lifestyle. Users can unlock Foodzy badges for certain eating habits, like the 'Forget-about-it-Badge' for eating lots of Italian food, or the 'Coco Jambo' badge for eating five kinds of tropical fruit. 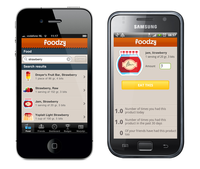 As of today, Foodzy's mobile apps are available from Apple's App Store and Android Market. Foodzy users can upgrade their free Foodzy Lite account to Foodzy Pro and use the app for as little as $15 a year.